Basholi paintings, a form of folk art developed in the Himalayan valleys (pahari), are a distinctive school of Indian miniatures. This watercolour is highly characteristic. The subject is delineated, the background an intense earthy red. Each of the faces in the painting are more stylised than realistic, and depicted in profile. The large eyes constitute oceans of expression. There is a lack of architectural depth in the painting. Note the pale muted pastels in the foreground, which complement the vibrant red. 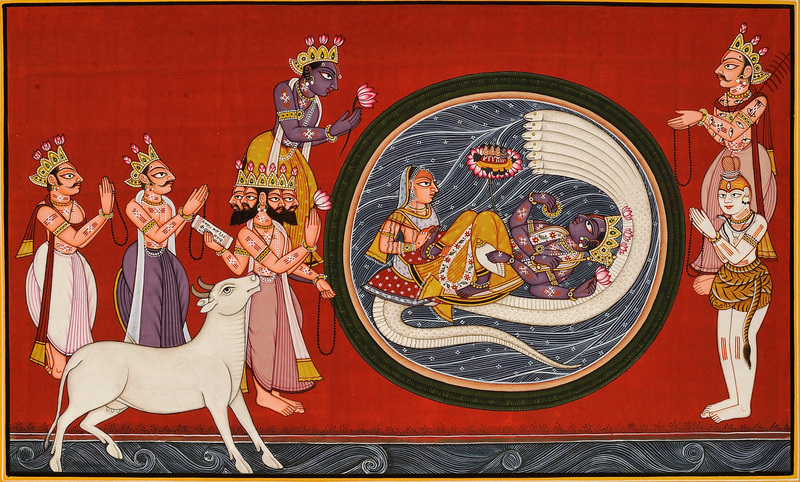 Around the circlet stand (clockwise from top right of the viewer) Indra, Shiva, the earth personified as the mother cow, Brahma, and Vishnu. Indra has numberless organs of vision all over his body, and a lightning rod of bones that He carries on His back. Shiva's loins are draped in tigerskin, the tail of the dead creature intact, while a string of pearls is tied around His jatamukuta. Brahma is offering a fresh lotus bloom to Narayana-Lakshmi seated within the circlet. So does the handsome Vishnu adorned in silks and gold and jewels. A couple of other smaller deities has joined Them in Their ritual supplication of Narayana to descend upon the human realm as Krishna. Do not miss the distinctive white-coloured adornments on each deity, on the ears and the arms and the torso, which conform to typical Basholi embossment. Within Their own alcove, Narayana and Lakshmi are in each other's company. While Narayana reclines in the coils of sheshnag, His lovely Lakshmi massages His feet. Neither of Her hands is free to pull back the long tresses that spread about Her shoulders. It is a momentous point in itihasa, right before Krishna arrived at the rescue of the heavily burdened worldly realm. Note how the background visual of Their circle matches the wave-like brushstrokes at the cow's feet, the latter seemingly the point of transition between the two realms.